The Austrian Medical Guidelines for EMF Sensitivity demonstrates a medical governing body taking EMF exposure seriously as a health risk. These guidelines were adopted in 2012 the year following the WHO - World Health Organization -- classification of cellphone radiation as a Class 2B Carcinogen. This download pdf 18 page document also includes EMF Sensitivity diagnostic guidelines for physicians, which may be helpful for dialog with your own health care provider (2012). The World Health Organization Guidelines for developing health-based EMF standards worldwide, includes a worldwide standards database limiting the exposure of EMF (2011). World Health Organization Model Legislation for Electromagnetic Fields Protection of the general public (2006). International EMF Project has compiled a database of EMF World Wide Standards, and is leading a a multidisciplinary and multi demographic EMF research Project of participating countries and entities, 2006 - 2016. EMF Safety Advocate and Activist Groups 16.A list of hundreds of EMF Concerned Citizens sites and EMF Safety Advocate Professional Groups around the world. If you are concerned about EMF Sensitivity that often follows on the heals of acquired Environmental Sensitivity, this multiple-award winning film is an informative eye opener. Learn what to be aware of, how to deal with it, the issues behind it, and the solutions to taking control of your safety and well being. ... how they got there and what we can do about it! Click to watch the movie and learn more about the hidden world of chemical pollution that is effecting your family's health, the environment of your home, workplace and our world. Over 80,000 chemicals are routinely used in America, and many go straight into our bodies. Even our unborn children are affected. Due to this constant unseen exposure, we have approximately 200 synthetic industrial chemicals interacting with our cells every single day. Until recently, modern science really didn’t understand what that could mean for all of us in the long run, but that is changing. Disease rates are on the rise in every country. Theories abound about the links between Environmental Sensitivity health issues and ever increasing environmental pollution, and their further links with EMF Sensitivity and its ever increasing pollution, yet the issues are complex and often muddied by the maneuvering of political and corporate interests. To get down to basics and explore everyday facts of common chemical exposure, Unacceptable Levels, was made in consultation with experts in multiple fields and is guided by a father on a personal journey as he attempts to bring these issues to light for everyone. The primary goal of this documentary? To determine whether we can prevent disease before it strikes us. 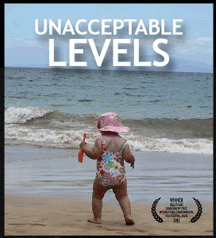 Unacceptable Levels opens the door to conversations about the chemical burden our bodies carry today so that we can make informed decisions now and in the future. The film poses challenges to our companies, our government, and our society to do something about a nearly-unseen threat with the inspired knowledge that small changes can generate a massive impact.